Audacity is free, open source software that makes it simple to record and edit audio on your computer. Installing Audacity on a PC isn’t difficult, there’s an extra step that’s often overlooked if you want to save your recordings as MP3s, rather than much relatively large WAV files. To download Audacity, go to the Audacity downloads page (http://www.audacityteam.org/download/) and choose the appropriate version. 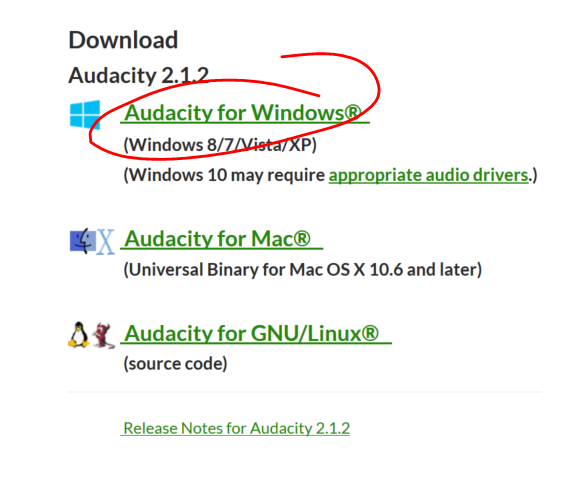 In this walkthrough, we’ll be looking at downloading and installing Audacity on Windows. There are two versions of Audacity available for download, an installer version and a zip version. We recommend downloading the installer, because the install process will be a bit simpler. Depending on your browser and set-up, the file may automatically be saved to your downloads folder. If not, click SAVE FILE and choose a location on your computer where you’ll be able to locate the installer if necessary. Next you’ll need to run the Installer. If you’re using Firefox, you can do this by clicking the DOWNLOADS button to view the files you’ve recently downloaded, then clicking the audacity-win-(version).exe at the top of the list. In Edge, you’ll want to click RUN on the downloads alert that appears at the bottom of the screen. To launch the installer from Chrome, click the audacity-win-(version).exe button that appears at the bottom of the page. If you can’t find any of these links in your browser window, just use Windows Explorer to navigate to the folder you downloaded the file to, then click audacity-win-(version). If you didn’t select a location, you’ll likely find the file in your DOWNLOADS folder. In the GIF below we use the Windows 10 Explorer link on the taskbar to find our Downloads folder. If you don’t have Windows 10, press E on your keyboard while holding down the WINDOWS key. At the first step of installation, User Account Control (a Windows security measure) will ask whether you want to allow the change. Choose YES. Next, you’ll be prompted to choose your install language. Choose the appropriate language and click OK. Then click NEXT as you walk through the install setup steps. After completing the 4 steps, Audacity will install. If exporting your recordings as rather large WAV files is sufficient, then you’re all set. We recommend installing the LAME MP3 library, which will allow you to save your recordings as much smaller MP3 files. To download the LAME Library, launch Audacity. Then click EDIT, choose Preferences, select LIBRARIES, then under the MP3 Export Library section, click DOWNLOAD in the LAME MP3 Library line. This will launch a web page in your default browser. Click the LAME DOWNLOAD PAGE link on that page that’s been opened. As with installing Audacity itself, we’ll download the LAME exe, as this makes the installation process simpler. The download and install steps, too, are basically the same as those we walked through for installing Audacity … Download and run the installer, allow UAC to run the installer, step through the SETUP wizard. Install and finish. Now you’re ready to export your Audacity recordings to MP3 as well as WAV.